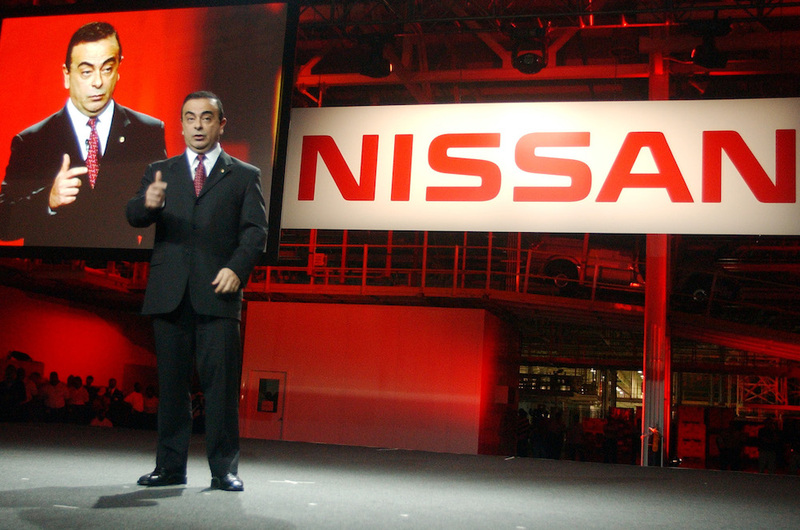 Nissan CEO Carlos Ghosn stands on a stage in the Canton, Miss., manufacturing plant as he prepares to unveil a Quest minivan during the opening of the facility, May 27, 2003. Photo by Rogelio Solis/Associated Press. The crushing rejection on August 5 of a United Auto Workers bid to organize a 6,500-worker Nissan assembly plant near Canton, Mississippi seemed to present the proverbial déjà vu all over again for organized labor’s ancient and oft-thwarted crusade to gain a serious foothold among Southern workers. This time, however, we are not talking about textile and apparel plants in the 1920s or ‘30s, but about a thoroughly globalized Japanese auto manufacturer, led until a few months ago by a French-educated, Brazilian-born CEO. What might seem to be no more than a classically Southern triumph of continuity over change is better understood as an example of continuity within change—one with implications ranging well beyond regional boundaries. Cheap labor has been the mainstay of efforts to lure industrial employers into the South since the 1880s. By the 1920s, union agents venturing into the region could expect withering inhospitality, not excluding brutal beatings by local sheriffs or company thugs. With these shows of physical force came a powerful and cohesive propaganda barrage, courtesy of racist and sectionalist politicians who linked labor unions to the abolitionists of the 1850s and the “race mixing” NAACP of the 1950s. Between 1944 and 1954, all of the old Confederate states strengthened their anti-union arsenals with right-to-work statutes outlawing the practice of requiring all employees of union-represented plants to belong to the union or pay dues. The union membership rate in the South was 50 percent of the national average in 1939, and as of 2016, the Southern average had slipped to 43 percent of the national mean—particularly telling given that the national figure is now only 10.7 percent. Since the 1930s, a steady proliferation of industrial enticements and subsidies, including free land, tax-exemptions, and low-interest bond financing offered by state and local governments has effectively made anti-unionism the sine qua non of Southern regional development strategy. Protecting these investments of public revenue and resources in private firms made it even more vital to keep the subsidized company union-free. As the cost of these concessions soared, the South became something akin to a lavishly appointed gated community for industrialists, maintained primarily at the expense of their own workers. Not only were union recruiters sent packing, but even potentially high-wage employers like United Airlines. In 1991, the airline met with vociferous opposition from the Greensboro, North Carolina business community when it revealed plans for a maintenance facility that would bring 6,000 well-paid unionized workers to a well-known haven for non-union industries. This much became apparent in 1977 when the French tire maker Michelin, which had recently opened a plant near Greenville, South Carolina, joined forces with local development leaders to keep a large, relatively high-wage, but likely-to-be-unionized Phillip Morris plant out of the area. Thirty years later, developers were still reminding Japanese industrialists that because South Carolina’s unionization rate was “one of the lowest in the nation” its manufacturing wage was also “among the lowest in the country.” In the long run, emerging global competition for new plants made it all the more imperative for the region to hold down labor costs by continuing to resist the incursions of organized labor. Nissan became the South’s first major international auto manufacturer in 1980, when it agreed to open a truck plant near Smyrna, Tennessee. Toyota would follow four years later with a facility near Georgetown, Kentucky, and over the next 20 years an invading horde of foreign automakers including Mercedes, BMW, Honda, Kia, Hyundai, and Volkswagen would stake their claims in the American South. As the list of firms grew, so did the size of the subsidies offered. With the bidding for new foreign car plants in full runaway mode, Tennessee’s initial $33 million payoff to Nissan seemed like pocket change compared to the $295 million show of affection that sealed its original agreement in 2000 to come to Madison County, Mississippi. Mississippi’s subsidy guarantees to Nissan now exceed $1.2 billion, with the total for all foreign automakers with plants in the South topping $4.2 billion. To this day, not a single production workforce at any of these heavily subsidized foreign auto plants has opted to join the United Auto Workers. Nissan’s non-union Tennessee and Mississippi operations are the only such plants among its 45 production facilities world-wide. Like its international peers as well as the great majority of the domestic manufacturers preceding it to the South, the company has frequently reminded workers, state officials, and leaders of the affected communities of their stake in keeping it that way. In the struggle in Canton alone, Nissan has racked up eight NLRB charges of unfair labor practices in the last 36 months. The anti-union onslaught in Canton over the protracted build-up to this month’s vote had a ferocity reminiscent of many such campaigns in years past. This time, however, the stakes were much higher, not simply in terms of money and jobs locally, but in the future of what has long been Mississippi and the South’s foundational development strategy of bringing jobs in by keeping unions out. Though the terminology and technology employed by both camps were different than they would have been 75 years ago, elements of race, religion, regional bias, and, of course, fear, were still part of the story this time around. Meanwhile, anti-union politicians were hardly less given to fear-mongering than they had been several generations earlier. Mississippi Gov. Phil Bryant warned, “If you want to take away your job, if you want to end manufacturing as we now know it in Mississippi, just start expanding unions.” Bryant’s message echoed one in a video shown to workers from Steve Marsh, the plant’s top executive, who pointed out that UAW workers at Ford and GM had “experienced significant instability in recent years,” including, “many layoffs and plant closings.” A representative of Kelly Services, which recruits temporary workers for Nissan, had warned more explicitly on Facebook that the Canton plant might close if the union came in. In the end, Nissan’s not-so-veiled threats of lost jobs were almost certainly critical to the roughly two-thirds vote against the UAW. An estimated 40 percent of the workforce are temporaries, who are hired at much lower starting wages, currently advertised by Kelly Services at $13.46 per hour. If they eventually join the regular workforce, these former temps come in at their current pay under a two-tier wage-benefit scale that caps their hourly wage at $24, roughly $2 per hour less than the average for a worker hired earlier on regular terms. Even so, a Nissan employee making $24 per hour would still be making as much as $385 more each week than the average for workers surrounding counties, including Hinds, which is home to the state capital. The key to this and countless other union defeats in the South and elsewhere, is not the ignorance of those who vote “No,” or their blindness to the potential benefits of union representation. Rather, it is the sobering, self-preservational realism of workers steeped in generations of unrelenting, sometimes unthinkable poverty. Although making some headway at long last, they remain acutely sensitive to the ephemerality of even the incremental progress they are finally enjoying as individuals and, understandably, are given to far greater skepticism of the more expansive version they are asked to accept on faith by others whose lived experiences often differ dramatically from their own.